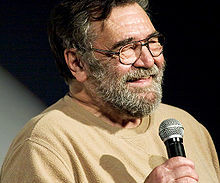 Ralph Bakshi (born October 29, 1938) is an American director of animated and live-action movies. His best known movies include Fritz the Cat (1972), Wizards (1977), The Lord of the Rings (1978), American Pop (1981) and Fire and Ice (1983). ↑ "Brownsville". Unfiltered: The Complete Ralph Bakshi. pp. 22–24. ISBN 0-7893-1684-6.